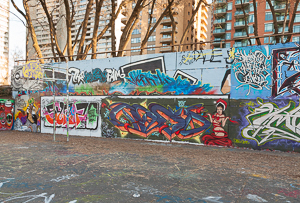 The City of Ottawa has established designated graffiti walls – special sites where it is perfectly legal to express oneself with a can of spray paint. The Tech Wall at the corner of Slater and Bronson is such a space. The area gets its name from the owners of the land, namely, the Ottawa Technical High School. My commute to work takes me past this location every morning. The park that the Wall finds itself in attracts locals of all stripes. From dog owners who meet to let their furry friends socialize with others (not to mention the human contact that the interaction affords area apartment dwellers), to kids of all ages playing a pick-up game of b-ball. The work on the wall ranges from tags to full-fledged murals. The wall is in constant renewal, and to the casual observer, it would appear that anyone’s great work is subject to being overwritten at any time. Given the effort and beauty of some of the work, that could be seen as disrespectful or egocentric, but the fact that the wall is capable of morphing to its own undefined rhythm simply underscores the very nature of graffiti – it can’t be tamed. If you see something that moves you to the point of wanting to take a picture, take it that day because the work could be gone the next day! Images on this page will be updated as the wall evolves over time.